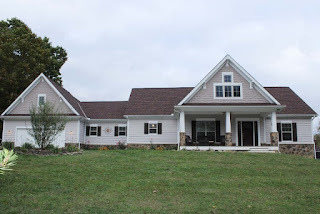 DeLena Ciamacco: The Real Estate Expert: NEW LISTING IN LAURELVILLE! A HUNTERS PARADISE!! Private retreat just minutes from Hocking Hills!! Stunning Craftsmen Style Ranch home nestled in the center of 20+ beautifully wooded acres. Gorgeous views from the deck and front porch. Kitchen with hardwood flooring, maple espresso cabinets, granite counters, stainless steel appliances including a gas range and convection wall oven, bar seating, subway tile/glass tile back splash. Kitchen is open to the Great Room with 12 foot ceiling & huge stone fireplace. Master Suite with lighted, double tray ceiling and attached Master Bath with double sinks, granite vanity, walk in shower and ceramic tile flooring. Finished walkout Basement includes wet bar, wine fridge, Full Bath and extra Bedroom/Den. Cabin with electric & wood burning stove, freestanding deck & screened pavilion overlooks a rumbling creek. 3 BRs & 3.5 Baths. Over 3,800 SF! Logan Schools. Only $489,900! Call DeLena today!